Get more out of your email with Outlook.com. We've streamlined search to make it easier than ever to find what you're looking for. New features like Files and attachment previews let you see your pictures and files without leaving your inbox. And now you can add emojis and GIFs to your messages. Note: To quickly change your settings so your inbox looks the way you want it to, see Personalize your new Mail experience in Outlook.com. When you sign in to Outlook.com, you’ll go straight to your Inbox. Create a new message by selecting New message. The list includes the folders in your mailbox. It may include other folders, such as Favorites and Archive folders. Select Expand to show the folders list, or select Collapse to hide it. Right-click an existing folder and select Create new subfolder. See Working with message folders in Outlook.com to learn more about available folders. In the Search box, type the name or email address of a person or a keyword you want to search for, and press Enter or select . Messages in the current folder are listed. There might also be a visual alert that a message is unread, has an attachment, or is flagged. At the top of the message list, you can choose how you want to view the list. Each message also has a mini toolbar. For each message, you can delete it, mark it as unread, flag the message, or pin it to keep it at the top fo your folder. The message or conversation that you selected appears in the reading pane. Use the command bar above the reading pane to perform common actions such as deleting, archiving, sweeping, moving emails, or categorizing. Select More to see additional actions—for example, an option to print a message. If you want to learn about printing, see Print emails and calendars in Outlook.com. Keep track of appointments, meetings, or any other event from anywhere. Add, edit, or delete events using daily, weekly, or monthly views. For more information about working with calendars in Outlook.com, go to Using the calendar in Outlook.com. Create a new event by selecting New event. Then, fill in information about the event. Under Calendars, My calendar is the default selection and displays the calendar in Month view. You can move forward or backward through calendar months using the arrows above the calendar. You can add other calendars, for example a holiday calendar, by selecting Discover calendars in the left pane. After you add a new calendar, you can choose whether to display it by selecting or clearing the calendar option. If you decide you don't want the calendar you created, right-click the calendar and select Remove > Delete. You can view more than one calendar at a time, add other calendars and select which to display, and create new calendars. Choose your calendar view: Day, Work week, Week, or Month. To return to today's date, select Today on the left side of the command bar above the calendar. Select a specific day in the calendar, and any appointment or event scheduled for that day is listed in this area. You also can select a day or time slot and create a new appointment or event. Use the People page to find, view, create, and edit contacts and contact lists. 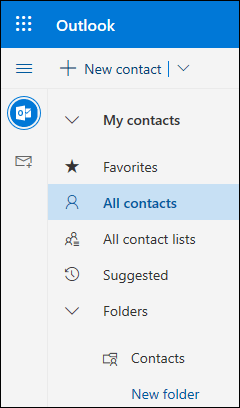 To learn more about managing contacts in Outlook.com, go to Create, view, and edit contacts and contact lists in Outlook.com. Start typing in the search box to find a contact or contact list. Create a new contact by selecting New contact. Create a new contact list by selecting the arrow next to New contact and then New contact list. Add a contact to your Favorites by selecting a contact in the list, and then selecting Add to favorites. When you add someone as a favorite in People, they'll also show up under Favorites in Mail, and the other way around, provided that the contact has an email address. To import contacts from other email services, export contacts, or clean up duplicate contacts, select an option from the Manage menu. Favorites: Shows contacts you've added as favorites, either in People or in Mail. All contacts: Shows your contacts from all folders. All contact lists: Shows your contact lists from all folders. Suggested: Suggested contacts, based on messages you've sent or received from addresses not in your contacts. Contacts under Folders: This is the default folder for contacts and contact lists. Select New folder to create more folders. Shows contacts or contact lists depending on what you selected in the left pane. Select a contact or contact list to view details in the contact card on the right. You can also select multiple contacts—for example, to send an email to the selected contacts. For contacts, you can select Filter in the upper right to select what to display in the list and how to sort. See or edit information about the contact or contact list. Contact someone directly by selecting Start chat or Send email. To change your Mail settings so your inbox looks and behaves the way you want it to, see Personalize your new Mail experience in Outlook.com. Also check out the Outlook.com Community forum. Select to open the Settings pane. Move the toggle next to Focused Inbox to off. Under Reading pane, choose Show on the right, Show on the bottom, or Hide. Under Conversation view, choose whether you want the newest messages to appear at the bottom or top of the thread. If you don't want your messages to be organized by conversation, select Off. At the top of the page, select your name or account picture. Select View account > Change password. In the message list, select the message you want to attach. Drag the message into the message compose pane. Position the mouse below the subject line and release it. The message should be attached. In the new Outlook.com, the default mode for viewing messages is conversation view. In this view, an email thread can include many items. If any item has an attachment associated with it, a paper clip icon appears next to that item in the message list. To find the item with the attachment, scan the list of items in the thread. Look for the item with the paper clip next to it. Currently, you can't directly create a meeting in the new Outlook.com. However, you can create a calendar event to which you can invite people. At the top of the page, select New event. In the text box, enter a brief description of the event, including a title, date and time. If you want to invite people to the event, select or More details to view the full event form. In the Invite people box, enter the names or email addresses of the people you want to invite. Select Save if this is an appointment you created for yourself or Send if this is a meeting with attendees. Sent email in Outlook.com comes back "delivery failed"